Things are heating up around here and it’s not just the weather! This is going to be a fairly long newsletter as there is a lot to tell you about. There are some wonderful projects happening: Phoebe is finishing up her Ramses II figures; Kris is truly closing in on the machine gun; Corey’s Harvey Milk diorama is taking shape; Carissa’s sword will be done within the next 2 workshops; Ross finished a fabulous dodecahedron in brass (Ross, did I get that right? ); Sarah has designed and is completing a custom dog bed; Nick has finished the initial superstructure on his layout and will begin working on the train bridge. On Sunday, Kris finished the Scrap Wood Carrier! Now we have no excuse for a messy barn. There are just 3 weeks left for this series of Build Stuff workshops so we are all focusing on finishing our projects! The new July film workshop started last week and it is lots of fun. Wesley finished up Introducing Ray. This was a very ambitious project. Working with just our rudimentary filmmaking set up we managed to create a film in which Wesley played all the characters – no easy feat. I think the visual aspect of the project was very successful. But I think we need to work on our sound quality and dubbing techniques. Here is a link to Nate’s blog post about the film (click on the arrow to start the film). Write your comments in the box at the end of the post! Devon completed her KOKORO project (all original drawings!) and she wrote the first student blog for the Autistry Studios site. Say hi to Devon by leaving a comment! Steven is working on his next Bupim Films production – this time starring Bupim! It is another ambitious project using animation, live action Popsicle stick figures and Steven’s unique voice over. Sarah is creating a claymation film entitled Termite about a young dog with a nasty chewing habit! Wesley is also helping Ian finish his Kung Fu movie. Yesterday they shot a new scene to add to the sequence Ian created in the last workshop. Ian’s rough cut of Kung Fu Fighting can be found here. Student Blogging: We can set up blogs for the Autistry Studios students to write about their projects. Devon jumped right in with a great first post. I look forward to a lot more blogging from all of you! Polaris Pilot: We have been asked to participate in a pre-pilot study being done by Polaris Health Directions in Pennsylvania. Linda Toche-Manley is creating an online assessment and tracking system to support the treatment of adolescents and young adults with high functioning autism/Asperger’s (HFA/AS). Basically her software program will help track the progress of students as they develop skills needed to be successful in college and in the workplace. The process is that each student will fill out an online survey every month answering questions about themselves (the survey takes about 20 minutes to do). Parents are also encouraged to fill out surveys to get their perspective on change. How does this help us? As we go grow the Autistry Studios program we will need to apply for large grants. Most funding organizations ask for some proof that a program is successfully attaining its goals. We have no tests or other measurements to show that what we are all doing here is beneficial. We do have anecdotal stories and wonderful letters of support from you all. But for the big grants it would be good to show some ‘real’ data. Linda’s pilot is for students between the ages of 13 and 21. So, most of us fit in that category. Please let me know if you would be willing to help with this study. All data is strictly confidential. About Grants: We are working on our 501(c)(3) status – lots of dreaded paperwork! In the mean time United Cerebral Palsy of the North Bay has very kindly agreed to be our fiscal sponsor. That means that we can now accept donations and those donations will be tax deductible. So, if you know of any organizations (foundations, family trusts, matching funds from employers, etc) who would like to contribute to Autistry Studios please let us know. I will get the necessary information to them. Our initial funding goals are for 1) Purchasing equipment and materials, 2) Opportunity Fund to offset fees for low income families, 3) Fund Autistry Studio internship positions for individuals who have participated in our workshops. August Possibilities: We will be taking August off – well, that means not having formal workshops. But we will be here so let’s think of dates/times to hold get-togethers. We can also plan events – a film night, a field trip (there’s a great exhibit at the Asian Art Museum on Samurai stuff), or another activity of your choosing. We look forward to hearing your ideas! The latest release from the Autistry Studios film collective comes from the mercurial mind of newcomer Wesley. The scenario he scripted for Introducing Ray got everyone involved; costume designing, set decorating, until our editing suite was transformed into a seedy bar interior (including a very detailed menu painstakingly hand crafted by Steven, creator of Larry Lysosome). Wesley dubbed his dialogue over the video, voicing each of his characters, and cut it together adding his titles, stills and video clips pilfered from the internet and voila! It was a group effort hatched from the imaginings of wizard Wesley. Stay tuned for “Kokoro”, Devon’s latest Anime Music Video with original drawings! One of the core values of Autistry Studios is that the students’ interests are the key to their growth and the foundation of our work. People with ASD can have extremely intense interests — so intense and obsessive that parents and caregivers can feel they need to treat them as perseveration. However, those compelling, obsessive interests are places you can reach and teach your children. Our son Ian loved Thomas the Tank Engine wooden trains. Shortly after Ian was diagnosed low-functioning Autistic (he was three years old) we went out and bought a set of the wooden Thomas trains. Name it — we had it. Probably thousands of dollars worth. I know I was so upset and frantic to DO SOMETHING that buying felt like doing. 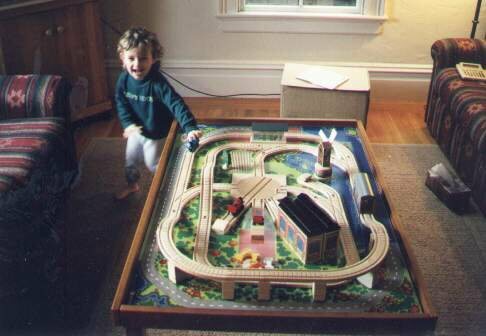 We set up the special table in the living room where you’d normally have a coffee table and I glued down a loop of track so he would not get frustrated when the track would move and Ian started to play with it. Had we done the right thing? Should we stop him? How would we take it away? Was he going to starve? To our immense relief, he finally stopped. The play got calmer. He took his meals sitting on the couch — near the trains. 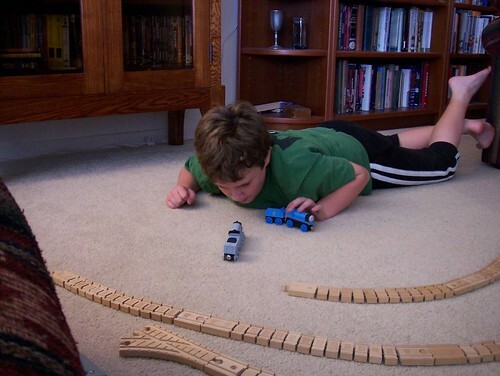 He would watch Thomas videos on the TV nearby and he started acting out the shows with his corresponding toy trains. Despite being largely non-verbal, Ian started to talk and reenact the conversations between the trains. 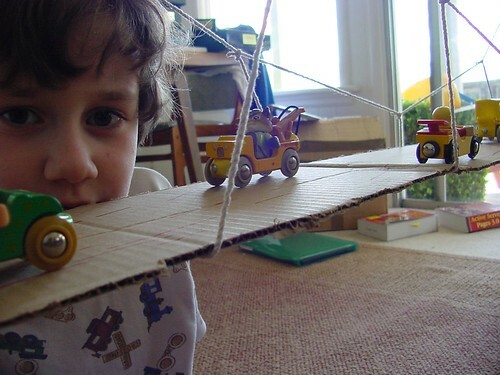 At night he would set out the trains on the dresser near his bed facing him and in the morning he’d carry them in to the train table and continue their adventures. 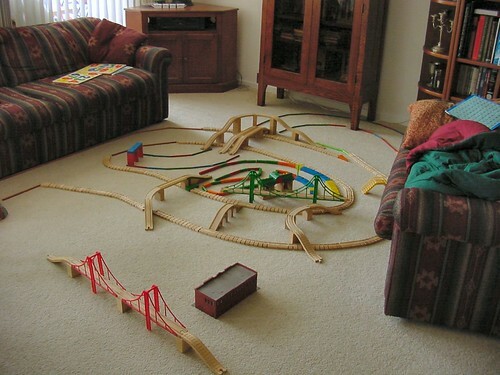 Over time Ian played with the trains less but he started to build huge networks with the train track all over the living-room which evolved to being local roads and freeways — not tracks (there are not many real trains around where we live). We bought those trains eleven years ago. Ian is now very verbal and has far outgrown his original diagnosis. Janet and I are strongly convinced that the right move was to engage Ian’s obsession — not to fear or avoid it but rather enjoy and admire it. We continue this approach today with Ian and with the students we work with. Boing Boing article Do autistic kids especially like Thomas Tank Engine? Our family has been on a Gluten Free / Dairy (casein) Free (GFCF) diet for over 10 years. In the beginning it was very difficult. There were few products available for home cooking and eating out was just not an option. In the last few years this has changed dramatically. Pamela’s Products baking mixes have become staple at our house. One of the first places to offer GFCF items on their menu was Disneyland. For our family this truly became the Happiest Place on Earth. This morning I found an email in my Inbox from Amazon announcing that Betty Crocker has a new line of Gluten Free dessert mixes. I haven’t tried them yet but I will order them and report back. 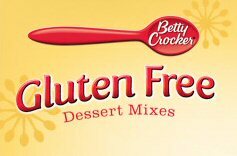 A section of Betty Crocker’s site is now devoted to their Gluten Free products.